As I needed a tool to test the maximum MTU size for a network, I needed a ping tool where I can define the packet size and the DF (Do Not Fragment-Flag). As I did not find such a tool, I wrote PingNG. It is a simple tool but the code had to avoid some pitfalls. // so the last two arguments are null. // Poll for completion information. The above checkHost function will be called by a thread and will either deliver a valid response or returns after a specified timeout. As the IcmpReply API call itself blocks too, the ping is wrapped into a thread. The status is delivered to the GUI using delegates and event subscribers. The small tool could be extended to do automatic sweeps over varying IP addresses or with varying packet sizes. There are still many enhancements possible. 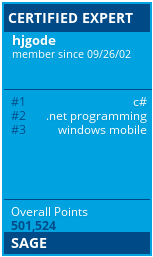 The project is done in VS2008 using Compact Framework 2.0 and targets Windows CE and will run nice on Windows Mobile too. The code is hosted at code.google.com (discontinued, now at github) as part of my win-mobile-code repo. I’m working on a personal project and I would like to install this on my device. Where can I download it? This tool looks really nice for what I need to do. There is no binray download. Youu need to checkout or download a snapshot of the code at https://github.com/hjgode/win-mobile-code/tree/master/PingNG (new location, code.google.com will be read-only and is deprecated). Then load it into Visual Studio having the windows mobile sdk installed and compile it. Look for vxUtils by Cambridge if you need a read-to-use ping etc.